Three Brazilian Agates with open space and hanging lampwork glass bead. Brazilian Agate with Moon Face and Lampwork Glass bead in open Space. 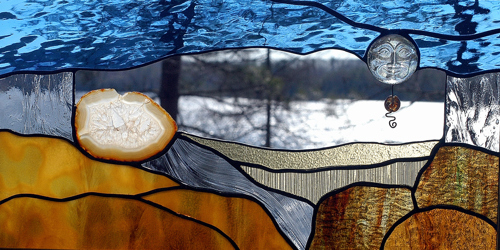 Pale colored glass sets off the center round Labradorite, in the open space. A single Lampworked Glass Bead with colorful glass frit hangs above. A clear glass square bevel acts as the base for the Labradorite, and the glass below echoes the colors in the precious gem stone. An interesting Brazilian Agate at the headwaters and a Moon Face looking over the striped fields, with a dangling Lampworked Glass Bead. 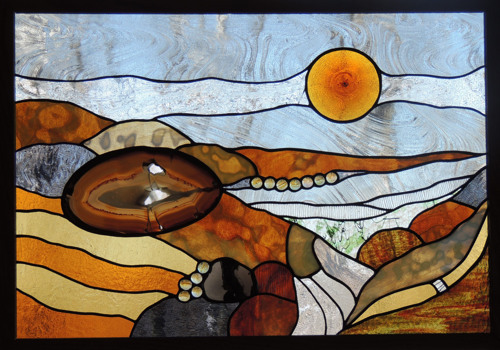 17" x 10"
This piece was lovingly designed with a large Brazilian Agate, Kokomo Amber Roundel, a slice of Jasper, and some mottled Chicago Art Glass, in multiple shades of amber. The next 2 windows were designed for my Brother and Sister-in-law. They are meant to hang next to each other or one slightly higher. When looking at them in that particular way they flow one into another....sort of like my Brother and Sister- Law. 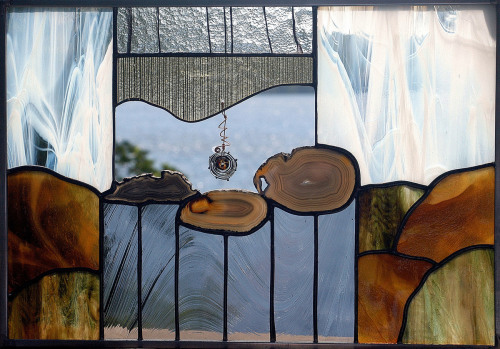 Each of them chose some different elements to be in their window, such as the Lace Agate and Beveled Leaves, the differing elements.....sort of like my Brother and Sister-in-law. Other elements are the same in both windows.....much like my Brother and Sister-in Law. 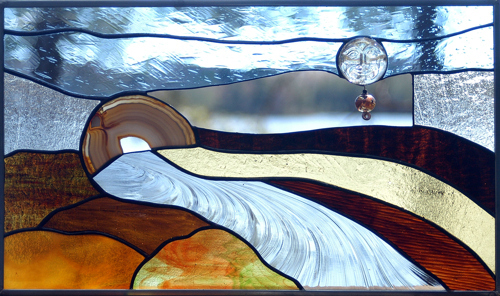 This window also has 2 Lampwork Glass Beads and some glass nuggets. 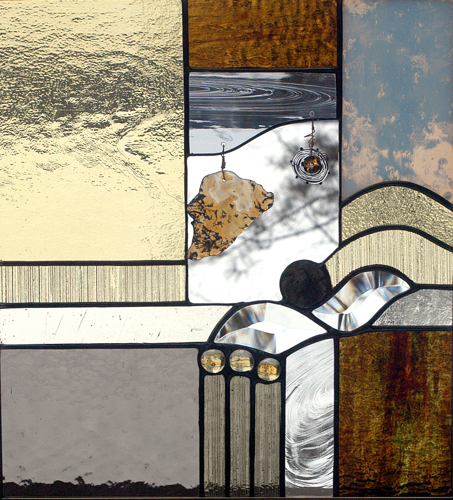 The second of 2 windows designed for my Sister and Brother-in-Law. 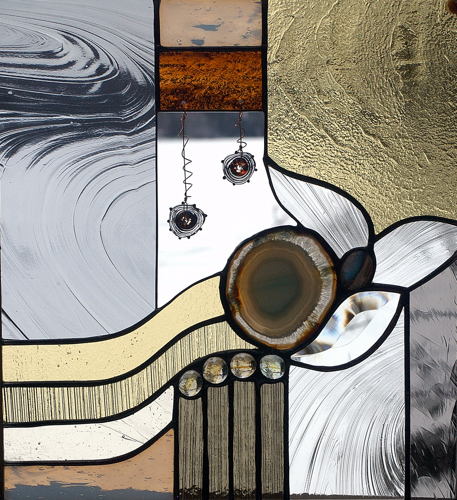 Each of them chose some different elements to be in their window, such as the Large round Agate and Labradorite Stone, the differing elements. Other elements are the same in both windows. 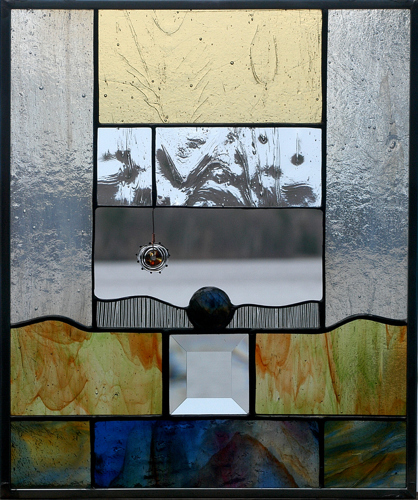 This window also has 2 Lampwork Glass Beads and some glass nuggets.